We only operate via the Internet and do not receive personal visitors. If this does not meet your requirements, please call us to see how we may assist you. We believe our products offer superb value for money. No prior notice is provided for price changes which become immediately effective upon publication. Our terms and conditions also include our Delivery Policy, Payment Methods, Returns Policy, Online Ordering and Security and Other Ordering methods. Please refer to them for full details. No two strings of pearls are alike as they are organic in nature and are put together by hand. By nature, all pearls have defects in them (the less defects, the higher the price generally). Part of the beauty in owning your own handmade string of pearls is its unique identifying character and marks. The colour of pearls may also vary slightly due to their nature. Please note the lengths of necklaces are approximate due to their handmade nature. We only display items in stock, or we mark ‘Out of Stock’ accordingly. Where several orders are received for the same item, thus depleting our stock, we apply the principle ‘first come, first served’. If we are unable to dispatch your purchase immediately, we will contact you the next working day and offer a solution. All jewellery is supplied ready to wear and has been handmade from cultured freshwater or saltwater pearls, some with other coloured stones as so described. 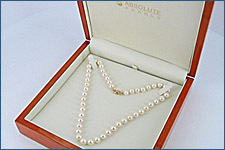 All necklaces are presented on professional pearl thread, individually and professionally threaded. Single strands of pearls are knotted between each pearl to prevent rubbing and damage of pearls. This also prevents the loss of any pearls if the necklace should break, except for those items presented on wire. 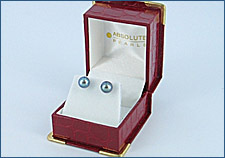 Typically, most multi-strand or fashion type pearls are knotted at regular intervals. Clasps or metal parts are either 9K, 14K, 18K, 925 Silver, or as described. Where the clasp is an integral part of the necklace, the end pearls are protected from the clasp with spiral wire or ‘French wire’ as it is also known. This also provides a professional and visually correct finishing. 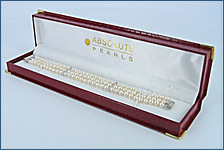 All pearl jewellery items are mounted in a handsome presentation case. 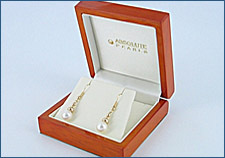 Many of our deluxe pearl jewellery items are presented in anexquisite natural grain polished hardwood presentation case. All other items are presented in a superior burgundy 'faux' leatherpresentation case. See sample photographs below.